I truly believe it's possible to have it all -- and that there's no point aiming anywhere lower than the top -- if you don't aspire to the heights, you'll never get above sea level! But having said that, I must confess that I'm new to breeding, showing, the whole bit -- in fact, I have only bred 3 litters so far. I have a fair bit of book larnin', but as far as breeding goes, I expect to encounter plenty of surprises along the way!. Everybody's got to start somewhere, and I have, at least, the advantage of a solid background in genetics. What I want to do is breed Cavaliers that are beautiful enough and sound enough to be competitive at high levels of competition, with excellent health and longevity, and with lovely temperaments to match. (Yes, I'm aiming high, but that's the point of goals, isn't it? -- to give you something for which to strive.) I specifically decided to breed Cavaliers not only because the breed suits me, but also because I thought it would be nice to "put my money where my mouth is" and see what contribution I can make to improving the health of this beautiful breed. I hope to be able to look back ten (and twenty, and thirty) years from now and be proud of that contribution. I have a Bachelor's in Biology from Earlham College in Indiana and a Master's in Ecology, Ethology and Evolution from the University of Illinois at Urbana/Champaign. I've been particularly interested in genetics ever since I bought my first dog, a Papillon, about fifteen years ago. 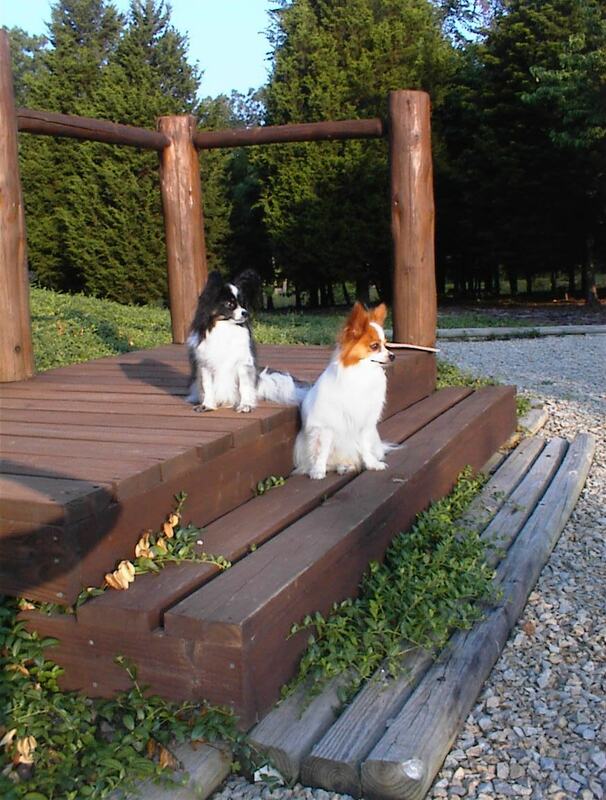 I still have one 'old man' Papillon, Volterra, along with my five Cavalier girls..
That's Lotka and Volterra on the steps, posing nicely for their pictures (summer 2002). Volterra is the one on the lower step. I also have two cats -- a sweet tortoiseshell (Quin) who "adopts" young puppies, and a rough-and-tumble tabby male (Chrestomanci) who likes to ambush unsuspecting dogs. I used to teach basic manners obedience classes a few times a summer in my local community. All of my own dogs need really good recalls and really good stays because they love to go hiking and need excellent hiking-trail manners -- they need to be able to sit for other dogs and people to go by. I live in southern Missouri. My parents own about seventy acres out here and they and I have log houses on either side of our gravel road. My mother is very helpful in taking care of the dogs when I'm out (thanks, Mom!). The dogs love to walk in the woods with me when I don't have time to actually take them hiking, and we stroll around in the woods around the houses every day from October through April when the weather isn't too awful. The Cavaliers show their distant hunting heritage by showing clear interest in birds, especially doves. Since I have enough hobbies already, they are out of luck -- I had to tell them that I have no intention of taking up hunting. I am a member of the Farmington Master Gardeners, although a lot of what I do falls into the category of "landscaping" rather than "gardening" -- my house is still relatively new and the land surrounding it is almost untouched (and a great deal of it is untouchable -- steep, rocky, wooded hillsides). The vegetable garden is all finished, with neat geometric raised beds, and the orchard is starting to bear well, especially the peaches. The fragrance garden has a rugosa rose hedge that's growing out well, but the woodland garden behind my house is still merely a gleam in my eye. I am a black belt in Tae Kwon Do, in the Yaun Wha Ryu school. I would not want to fight off an axe murderer, but hopefully I will be able to hold my own if I really need to. This makes me feel more secure hiking alone (alone except for very small dogs!). I like to cook, when I have time. I make excellent cheesecakes. When not doing anything else, I have a book in my hands. Some of my favorite authors include Patricia McKillip (fantasy), CJ Cherryh (science fiction), Barbara Hambly (for her great mysteries as well as her fantasy), historical fiction (Gillian Bradshaw, definitely! ), and gardening (Henry Mitchell!). For sheer fun in cookbooks, I vote for Caramel Knowledge by Al Sicherman. I read books on evolution and animal behavior and psychology and genetics (Hutt's Genetics for Dog Breeders is my top pick even though it's old, old, old (1978)) and I read anything by Thomas Sowell -- even his economics textbooks. I even read the odd classic, and I love Jane Austen. And did I mention my own books? I hope you enjoy this site -- especially if you're interested in genetics and the breeding of animals. Let me know what you think.